Jim Shore's hand-carved Heartwood Creek collectibles impart a sense of hope and nostalgia, embracing inspiring themes of family, tradition, spirituality, and patriotism. 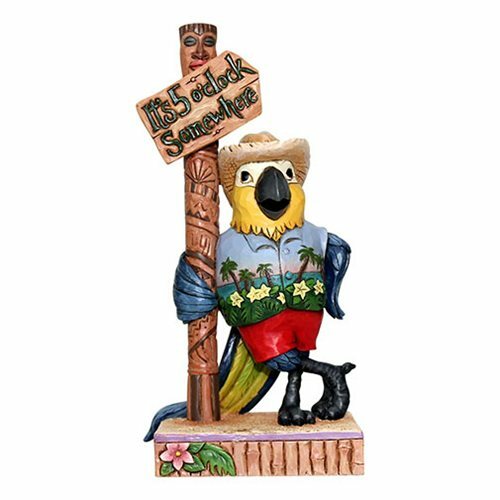 The Margaritaville Parrot by Sign Post It's 5:00 Here Heartwood Creek Statue by Jim Shore will take you straight to the tropics. Handcrafted from stone resin, it features a hand-painted island scene and Jim Shore's signature rosemaling. The whimsical statue is perfect for Jimmy Buffet fans – or anyone who enjoys a sunny day off at the beach. Measures about 6-inches tall x 3 1/10-inches long x 2-inches wide.